Video Listening Task Present Progressive - What are you doing Russell? Listening comprehension task using this video http://www.metacafe.com/watch/759582/present_progressive_tense/ Students have to fill in the missing present progressive forms. Tongue twisters to memorize and practise pronunciation. 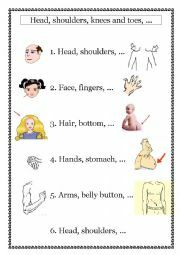 Additional verses for the song "Head, shoulders, knees and toes"
I printed out a transparency to sing additional verses of the song "Head, shoulders, knees and toes" with my year 5 students. They certainly enjoy it. Have fun! The simple past forms of a number of verbs have to be found in a grid full of letters. Students have to match sentences and create the 2. half of given sentences. They are also asked to form sentences about what they would do if certain things happened to them. Days, Months, Seasons - Unscramble the words! Words for days, months and seasons have to be unscrambled and put into the correct order. This film is worth while watching with teenagers (15+) if you deal with South Africa in your lessons. 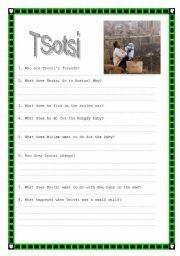 The questions of the worksheet help to summerize the plot and discuss what changes take place in Tsotsi. 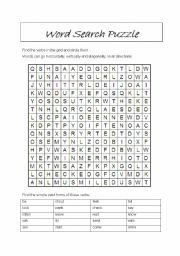 Students have to find 14 outdoor activities in a wordsearch puzzle. Key on page 2. 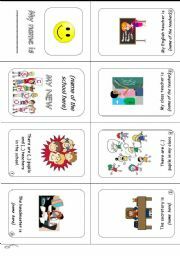 If you download the worksheet you can read the title: "Find fourteen outdoor activities". 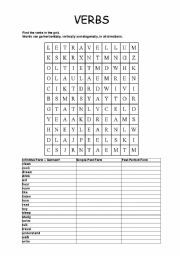 Revision of verb forms Wordsearch puzzle with given verbs. Simple past and past perfect forms are asked for. Students have to fill in the correct present progressive form of the verb. 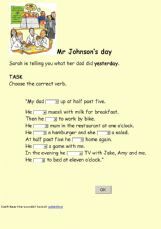 Students have to choose the simple past form of the verb.